"Schiller" redirects here. For ither uises, see Schiller (disambiguation). Johann Christoph Friedrich von Schiller (German: [ˈjoːhan ˈkʁɪstɔf ˈfʁiːdʁɪç fɔn ˈʃɪlɐ]; 10 November 1759 – 9 Mey 1805) wis a German poet, filosofer, physeecian, historian, an playwricht. Durin the last seiventeen years o his life (1788–1805), Schiller struck up a productive, if complicatit, friendship wi the awready famous an influential Johann Wolfgang von Goethe. They frequently discussit issues concernin aesthetics, an Schiller encouragit Goethe tae feenish wirks he left as sketches. This relationship an these discussions led tae a period nou referred tae as Weimar Clessicism. They forbye wirkit thegither on Xenien, a collection o short satirical poems in which baith Schiller an Goethe challenge opponents tae their filosofical veesion. 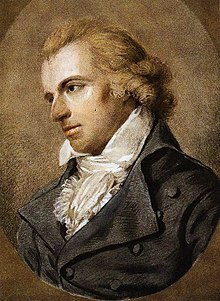 Wikimedia Commons haes media relatit tae Friedrich Schiller. This page wis last eeditit on 10 Apryle 2017, at 05:01.